This is not a sermon, it is a love song. It is the story about that which may save us, even as we try to save others." – Jennifer Crocker for the Cape Times. Read the full review on PressReader. "At the [recent] Digital Edge Live conference held in Johannesburg and hosted by NativeVML, guest speakers explored the concept of storytelling. Author Rahla Xenopoulos was among them, and she implored the audience to find ways to disconnect from the virtual world in order to rediscover the art of telling great stories. " Watch the interview below and for the full feature of Rahla's interview on Adlip South Africa, click here. On this episode of the Book Show, Redi and Jenny talk wine, books - and music. Giving two bottles of Morgenster Caruso to a few people and asking them to pair the wine with a book and some music. Rahla is featured alongside Bongani Madondo, John Maytham and Justice Malala. Rahla Xenopoulos, talks to Andrea van Wy about what inspired her book, "Tribe", how she managed to get Chad Smith from Red Hot Chili Peppers to give her a quote for the cover, and what she's she'll be getting up to next. A quick interview on the The Jenny Crwys-Williams Show where Rahla chats to Jenny about her latest novel, Tribe. Rahla speaks to Tamara LePine-Williams about her latest novel Tribe on Classic Lifestyle . 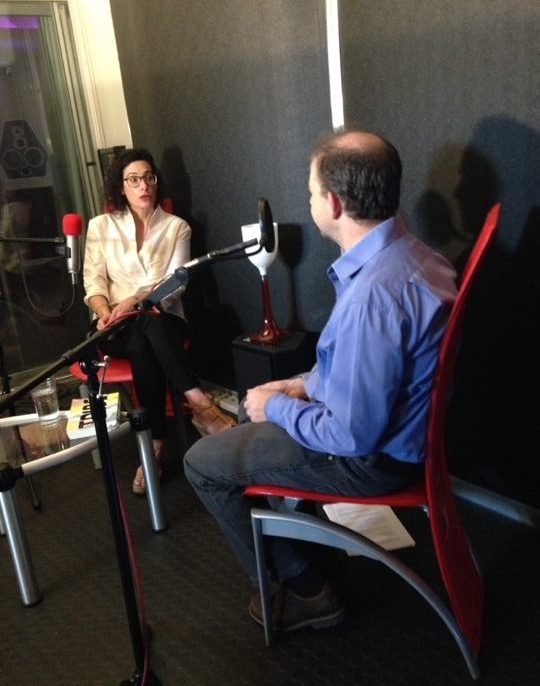 Sue Grant-Marshall interviews Rahla Xenopoulos about Tribe, for Reading Matters on Radio Today. Rahla chats to Jonathan Ancer of AmaBookaBooka, a novel podcast series about books and the people that write them. "Author, wife and mother of triplets Rahla Xenopoulos joins Gareth Cliff and the team to discuss her new book, ‘Tribe’, a novel that explores Generation X. ‘Tribe’ chronicles everyday things that we all deal with, in an intriguingly deceptive way. The third book from the writer sees her look at what makes this age group from the early 1960s to the early 1980s different and similar to the other generations. Xenopoulos discusses why she believes we’re living in a very exciting moment and who she believes are the real heroes today." Tribe is a story about confronting the darkest parts of oneself, about the rarest of relationships – real friendship. It’s not only the characters who are forced to confront their painful mistakes; the reader inevitably has to do the same. Despite its comparison to Less Than Zero, this novel is fresh, uniquely engaging, and unlike any I’ve read before." Read Andrea van Wyk's full review on Rant and Rave Reviews. "With Tribe, Xenopoulos has produced an iconic work that defines a generation … MY generation. I can already feel myself getting quite irate at the numerous young upstarts who will undoubtedly do their damndest to claim it as the literary representative of their own generations! The tribe in question is BENJYOLIVIAPIERREHANNESTSELANEJUDE, for they are forever intertwined, and therein lies both their destruction and their salvation. They are so tightly locked together– ‘No Trespassers Allowed’ – that they battle to come to terms with a world outside of themselves, even when they have to go out into that world and attempt to make lives for themselves and do the inevitable growing up that is a rite of passage for most people." Read the full review on Jan's Book Buzz. A group of friends that haven't seen each other for twelve years get together on a luxury game farm in South Africa to try and save Jude, one of their clan. Most of the tribe are wealthy, with access to the kind of privilege most of us can only dream of. Theirs was a life of excess and hedonism, but in middle age, they are facing the same demons most of us do, albeit with fewer of the financial worries. Jude and Tselane, his wife, are the only two who are middle class and struggling financially. In spite of having the kind of wealth I can only imagine, I found each of Xenopolous' deeply flawed characters to be beautifully drawn and recognisable. Olivia, a gorgeous aging IT girl, obsesses about losing her looks and wonders what value she will have in the world once she does. She tries to limit her five year old twin boys iPad time, while being addicted to screen herself. Tselane, the daughter of a struggle hero living in exile, searches for identity while refusing to acknowledge the land of her birth. Benjy, Olivia's emasculated investment banker husband, fears the day he is fired and will no longer be able to keep Olivia in the style she is accustomed to. While these concerns may seem far away from most of us, we all worry about our finances, have had our expectations of our bodies warped by the media and who in the modern world does not struggle with addiction, whether it be drugs, yoga or social media? Through her characters, Xenopolous taps into the zeitgeist of the developed world, a wasteful society where the gaps between the rich and the poor are growing. She questions privilege, and asks what responsibility, if any, those with it have towards the less fortunate. She asks the reader to examine the things we value and consider whether the way we are living is the way we want to live. And she comes at it from all sides. All this, however, is wrapped up in an absorbing read about a group of fallible people whose love for each other has the power to both destroy and save them. It's a book you can kick back and relax with while having your mind tweaked. It reminded me of Claire Messud's The Emperor's Children. I read it too quickly, while trying to slow down because I didn't want it to end. Ruby Wax in conversation with author Rahla Xenopoulos about her new novel, Tribe. Rahla met up with Jennifer Sanasie at News24 to discuss fashion, family and her latest novel, Tribe. Nikki speaks with author Rahla Xenopoulos about her book ‘Tribe’ which is about a group of close friends who reconnect following a tragedy after not seeing each other for many years. Listen to the full interview on Cliff Central. – Excerpt from "The Darkness Behind the Light: Kate Sidley Talks to Rahla Xenopoulos About Her New Novel, Tribe"
Read the full interview on BooksLive. "In fact almost every human frailty is put under the microscope in Tribe. But, it is done so in the most readable manner. Under the beauty of the African sky, ugly truths unfold and the characters are steered through a series of events that almost every reader will identify with on some level. There are big questions asked in Tribe: Can we fix time in one place? Is it possible to change in a week? Why is it that the weakest link is often the strongest bond? And these are just some of the probing concerns presented to the reader in a fantastically readable passage."